Side leg raises, also popular as side leg lifts, is one of the most effective exercises for building strength in your hips, glutes, thighs, and abs. All you need is a chair, and you can do it from the comforts of your home. Add this workout to your routine to prevent issues with your hips, lower back, and knees. 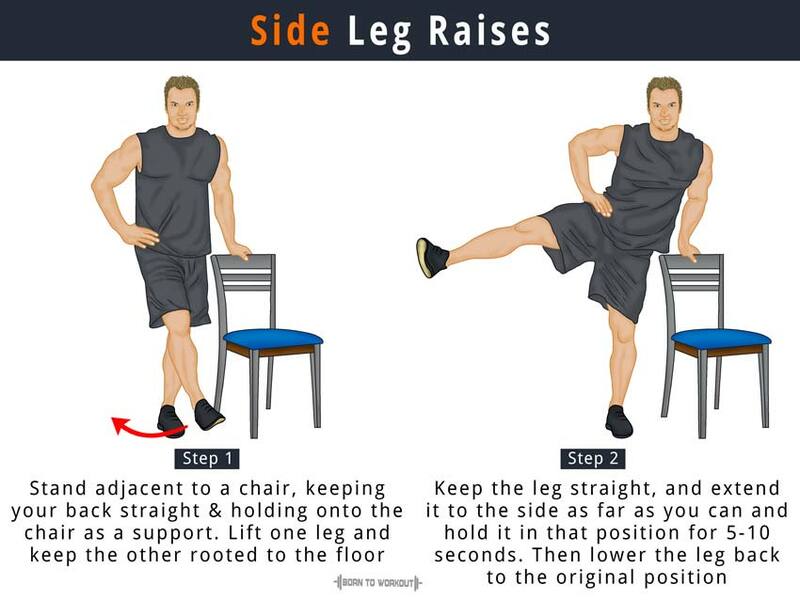 Side leg lifts target the adductor muscle group, which is essential for performing daily activities like walking, lifting, and balancing. By working these muscles, side leg raises make movements more efficient. It tones your hips, butts, and thigh muscles, reduces excess fat, and increases lean muscle mass. Stand adjacent to a chair, keeping your back straight and holding onto the chair as a support. Lift one leg and keep the other rooted to the floor. It is your initial position. Keep the leg straight, and extend it to the side as far as you can and hold it in that position for 5-10 seconds. Then lower the leg back to the original position, crossing the other leg. Repeat the motion 5-10 times, and increase the range over time. Perform the exercise with the other leg.